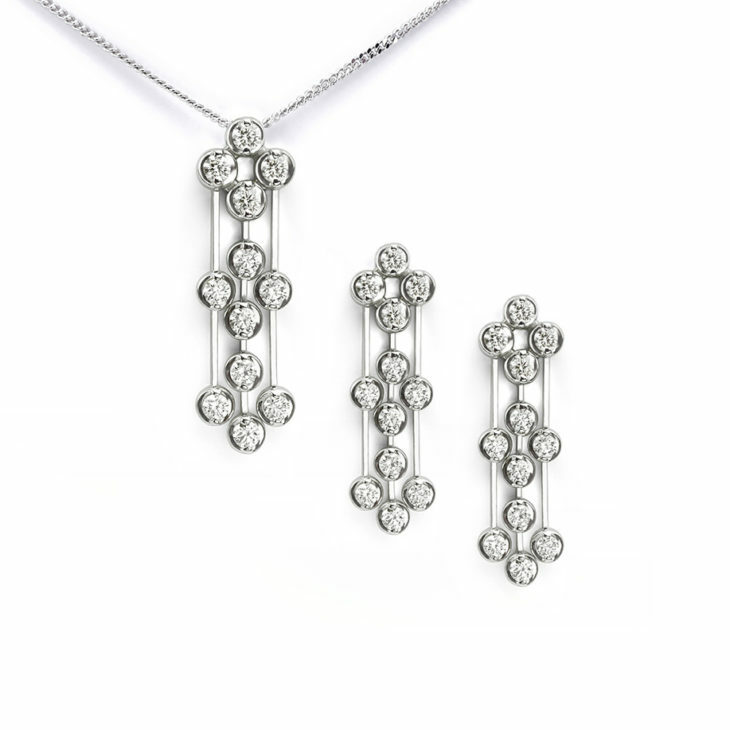 Earlier this week, we introduced a brand new diamond earring and pendant set. Both designs were inspired by the Art Deco period of jewellery design. 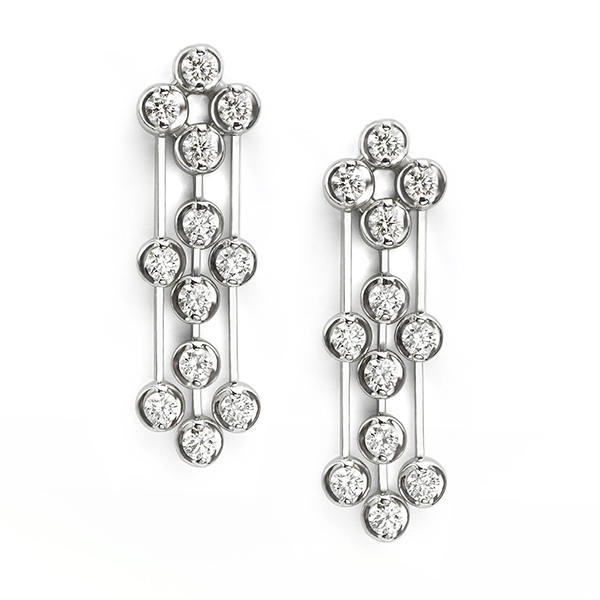 Our first design is the Art Deco diamond earrings. Both diamond earrings dangle from the ear lobe on three cascading strands of diamonds. 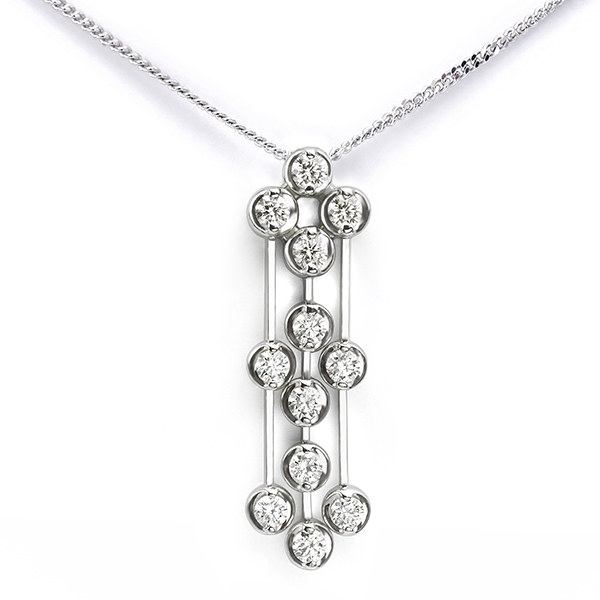 Each strand features diamonds settings articulated along the design. They are the perfect addition to evening wear and boast half a carat of round brilliant cut diamond. Each setting is mirror polished to reflect the maximum amount of light. In addition, each earring arrives elegantly presented in its own presentation box. The Art Deco diamond pendant completes the set. Clusters of four diamonds gather on freely moving strands crafted in 18ct White Gold. With a total diamond weight of 0.68cts, the Art Deco pendant is suspended from a classic 18 inch curb chain. In addition to the beautifully finished setting, each diamond is graded G colour and VS1 clarity before setting. 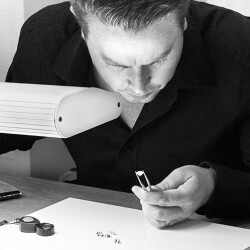 If you’re looking for more inspiration for Art Deco inspired jewellery, our Bespoke design service will help create the perfect jewellery design. Whether you are looking for a Vintage styled pendant or a contemporary diamond pendant, let our team help create you the perfect piece of jewellery.